Are you a Muggle looking for a fun game to play with friends or your family? Fortunately, you’ve got a lot of great choice when it comes to cool Harry Potter games for the whole family. 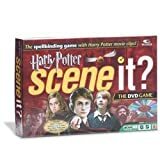 So whether you’re into card games, trivia games, or something else, there is certain to be a Harry Potter-themed game that you’ll love to add to your family game night. And best of all, you can find something for all ages. So, check out our list of the best Harry Potter board games and more! Checker is one of those classic games that you can play at any age, which is what makes this a great option for families. What’s cool about this game, and what makes it a must-have for Harry Potter fans, is that the checkers pieces look like coins from Gringotts bank. And if that isn’t cool enough, you store the “coins” in little money bags. Though they look metal in the images, the coins are made of a lightweight plastic. 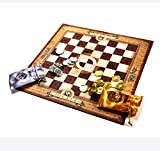 Overall, we find the cardboard game board to be sturdy and quality and the checkers pieces to be of decent quality. While we’d prefer to the “coins” to be metal, this is still a nice game for Potter fans who enjoy playing checkers. Definitely an awesome game for muggles. Classic game of checkers reimagined with the Gringotts coins used as the pieces. Features full-color artwork on game board. If you’re looking for something a bit more challenging, then this cooperative deck building game should meet your needs. Since it is a bit more difficult than checkers, the recommended age group is age 11 and up. You can play this game with two to four players, and like most strategy games, expect game play to take between 30 minutes to an hour (depending on which “Book” you are playing in the game). And if you’ve ever played anything like Pandemic or Forbidden Island, then you’ll recognize that this is a co-op strategy game where the players are supposed to help each other and work together to win the game. It’s really a lot of fun, even for adults. And, it’s fun for just two players – you don’t need all four players for it to be enjoyable to play. One of the things that we really like about this game is that as you play each level (“book”), it becomes harder and more involved. You’ll also notice that it takes longer to play the levels as you progress. But it’s really a lot of fun if you enjoy cooperative deck building games. You can also buy this game at ThinkGeek. And if you really enjoy this game, then you should know that there is an expansion deck that you can add for even more fun. It’s the Harry Potter: Hogwarts Battle – The Monster Box of Monsters Expansion Card Game. Keep in mind that you can’t play this expansion deck alone – it is meant to be added to the game above. Venture into the Forbidden Forest as you encounter creatures! Work together to defeat the evil forces and protect iconic locations to make the Wizarding World safe once and for all! Another classic board game that gets the Harry Potter treatment is Clue. If you enjoy playing the old school version of the game, then you’ll really dig this Potterverse version. The game board takes place in Hogwarts, and just like in the books, parts of the school can move and change where they are located. We think that is honestly one of the coolest things that any of these games offer. The object of this game is to discover WHO did it, WHAT spell or item they used and WHERE the student was attacked. Three players are required for this game as there is no two-player variant of it. And the recommended age group is age 9 and up. Expect game play for three people to take around 45 minutes, and for five people around two hours. Though we find the game a bit expensive compared to other board games, we can’t deny that the game board looks cool and it’s definitely fun to play – if you have three people for game play. You can also buy this game at ThinkGeek. Test your knowledge of all things Harry Potter with this game – see who knows more about Potterverse, you or your friends and family? 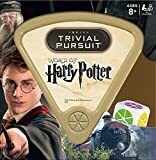 This fun take on the classic trivia game is definitely a lot of fun for fans of all things Harry Potter. You only need two players for game play, and the recommended age group for this one is ages 8 and up. The game has a total of 600 questions with six different trivia categories available for game play. Six trivia categories include: The Dark Arts, HOGWARTS, Magical Spells & Potions, Magical Objects, Magical People and Animals & Magical Creatures. Our only real complaint about this game is that it is based off the movies and not the books. If you enjoy playing chess, then you will really like this cool wizard chess set – just like you see in the Harry Potter movies. Of course, the only difference is that the pieces aren’t life size and alive. The board is approximately 18½” X 18½” (47 cm X 47 cm) and made of sturdy cardboard. The height of the pieces vary between the King at 4½” (11.5 cm) and a pawn at 2¼” (5.7 cm). Unfortunately, the pieces are made of a heavy plastic – we’d prefer pewter or something similar at this price point. That being said, it does seem to be of decent quality and it’s still a fun conversation piece. You can also buy this chess set at ThinkGeek. If you’ve played and enjoyed the old school game Trouble, then you’ll like playing this variation of it. In this game, players pop the die and move their playing pieces around the maze, racing to reach home. It features fast-action Pop ‘N’ Race play as you race around the Triwizard hedge maze to capture the Triwizard Cup! Be careful – action spaces cause you to draw a card that can help or hurt your chances. Land on a “draw” space to draw a Maze Card. Will you find a spell to send your opponent to another space on the board, or will a wind gust reveal a shortcut in your path? Cards can help, or hurt, your race through the maze, adding increased excitement and anticipation to the game. Overall, we think that this is a fun game for families with kids and we like that it is one of the cheaper options out there for Harry Potter fans. Calling all wizards! 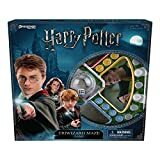 This board game is for two to four players who can handle the latest Hogwarts problem – magical beasts have broken loose at Hogwarts. In this action-packed game, you play as Harry Potter, Ron Weasley, Hermione Granger, or Ginny Weasley. Collect clues to track down creatures both inside and outside Hogwarts! watch out though, moving from Hogwarts to the grounds nearby can be treacherous and cost you clues and precious time. The dynamic swinging game board adds excitement that leads to hours of fun. This game relies mostly on luck, but there is the need for a little strategy to come out victorious. It is recommended for ages 8 and up and it can be a bit repetitive and boring for adults. If you’re shopping for a game for adults only, then we recommend the CLUE game version above instead of this one. If you’re already got the Trivial Pursuit edition above, then consider adding this Pictopia game version to your next game night. You can play with two to six players and it is recommended for ages 7 and up. The game comes with 200 Cards, 6 Answer Dials, 30 Prophecy Coins, 1 Game Board, 6 Movers, 1 Die, and Instructions. 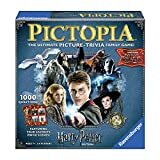 In this game for families and fans alike, you’ll encounter 1,000 picture trivia questions that will transport you to J.K. Rowling’s Wizarding World—discussing beloved characters and magical creatures, revisiting magnificent locations, and marveling at enchanted objects from the epic Harry Potter movies! The game includes content from all the Harry Potter films including the newest movie, Fantastic Beasts. Honestly, we here at Gaming Weekender prefer this over Trivial Pursuit. If you enjoy a variety of card games over board games, then you can still bring a bit of the Wizarding world into your card games. 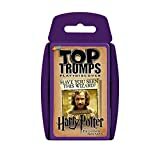 Just check out these cool Harry Potter playing cards. These cards are in full color and really cool for the Harry Potter collector. Our only complaint so far is that Dobby isn’t in any of the card images. But even so, we still think these are a great addition to the home of any Harry Potter fan. The first thing that you need to know about this game is that you can buy it for all the other movies/books as well. We just chose “The Prisoner Of Azkaban” because it was our favorite of the movies. This game is geared more towards kids and is the perfect road trip game or airplane game to keep them occupied. However, two players are required for it. Can you solve the mystery of the forbidden spell? 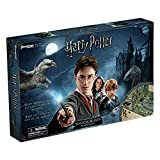 This Harry Potter Mystery at Hogwarts Game from Mattel takes you on a magical ride through the halls of Harry’s famous school. Someone has cast a forbidden spell and you need to figure out who did it, which classroom they were in and what spell was cast. But be careful: Peeves, the poltergeist, is out to get you. This game is designed for between two to six players. The recommended age group ages 8 and up. Note that this is a “Clue” type game and not a trivia game. Compared to CLUE, this game requires just a bit more strategy. This Harry Potter Mystery at Hogwarts Game from Mattel takes you on a magical ride through the halls of Harry's famous school. Someone has cast a forbidden spell and you need to figure out who did it, which classroom they were in and what spell was cast. But be careful: Peeves, the poltergeist, is out to get you. Like all Scene It? games, this version is DVD based and contains clips from the Harry Potter movies. 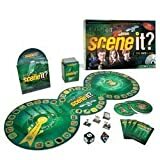 You are asked trivia about the movies in this interactive DVD board game. Overall, this is a fun game for the whole family or for a group. You need between three and six players for game play, with the recommended age group being ages 8 and up. Expect for game play to take you around 45 minutes for three players. Hurry and visit all the shops of fascinating Diagon Alley to buy wizard school supplies before they run out. The Harry Potter Diagon Alley board game is an exciting race of spending, scheming and casting spells to beat out your opponents. In the world of Harry Potter, Diagon Alley is the long, cobbled street filled with the most amazing shops in the world, accessible only through the Leaky Cauldron Pub in London. Includes game board, 6 trunk cards, 46 Diagon Alley cards, 36 trunk items, 60 wizard coins, 6 moving hats, die and a “closed” sign. Hurry and visit all the shops of fascinating Diagon Alley to buy wizard school supplies before they run out. In the world of Harry Potter, Diagon Alley is the long, cobbled street filled with the most amazing shops in the world, accessible only through the Leaky Cauldron Pub in London. The Harry Potter Diagon Alley board game is an exciting race of spending, scheming and casting spells to beat out your opponents. Includes game board, 6 trunk cards, 46 Diagon Alley cards, 36 trunk items, 60 wizard coins, 6 moving hats, die and a "closed" sign. For wizards and muggles ages 8 to 108. This is your chance to shop Diagon Alley. An update of the first Scene It? Harry Potter game, this one covers the movies up until the fifth movie. So, if you’re looking for an updated version that includes more movies, then this is it. This interactive DVD board game works and plays just like the other version listed above. It’s also great for family game nights. Everybody's favorite DVD trivia game is back, with more questions! Are you the resident Hogwarts expert in your home? If you do buy it used, then be sure ti carefully read the description so that you’ll know if pieces are missing (which is common for used games this old). This video game is a few years old and is available on mostly older gaming systems, like the Nintendo Wii, but you can still get it for play on some current consoles. You can play this as a one player or two player game. This game is even older than the Years 5-7 above, which means that even fewer platforms are supported for it. Experience your favorite Harry Potter moments through the proven prism of the LEGO video game franchise. 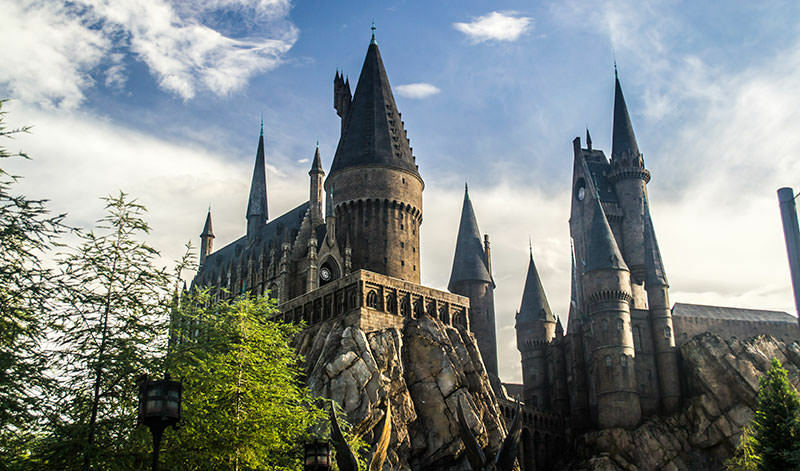 Explore iconic settings including Hogwarts castle, Diagon Alley, the Forbidden Forest and the village of Hogsmeade. LEGO Hogwarts castle is a grand, immersive 3-D environment and the largest, most detailed LEGO game location ever built. Play as Harry Potter, Ron Weasley, Hermione Granger as well as other favorite characters with over 100 possible options. Attend lessons, cast spells, mix potions, fly on broomsticks, and complete tasks to earn points. Like the two LEGO Harry Potter video games listed up above, this one is also older and not playable on the newest gaming consoles. But, if you still have one of these older working systems, then you can enjoy playing this game. Feel the thrill of Quidditch as the Wii Remote and Nunchuck become your broomstick and you speed through the stadium. Defeat the Dark Forces as you use the Wii Remote as your wand to duel your way through the story of Harry Potter and the Half-Blood Prince. Perfect your potion-mixing skills using the Wii Remote to stir, shake and pour potions from the Half-Blood Prince's recipes. Like the other Harry Potter video games listed up above, this one is also older and not playable on the newest gaming consoles. But, if you still have one of these older working systems, then you can enjoy playing this game. As you can see from the title for this one, you have to play this game on the XBOX 360 and it requires Kinect to play. If you have the 360 and Kinect, then you’ll probably find this to be a lot of fun. You can challenge a friend in competitive mini-games, or join forces against a mutual opponent in co-op games. If you don’t have the older gaming console systems and want to play the LEGO Harry Potter games, then you’re in luck. Both of the games are available together in this collection that is exclusively for the Playstation PS4 console. A perfect gift for fans eagerly anticipating the upcoming film, Fantastic Beasts 2.